In this video Sammy Davis, Jr. imitates Nat King Cole as he yucks it up with the smoothing singing legend, and Nat King Cole really gets a kick out of Sammy's over the top impersonation of his singing style. Sammy Davis, Jr. had an amazing knack for impersonation and often incorporated that into his act. Sammy Davis, Jr. was one of the finest tap dancer ever, as well as being one of hell of an all round entertainer. Starting on the boards of vaudeville as a child, Sammy grew up to become a dancer, singer, musician, actor and fine comedian. Arthur Silber, Jr. and Sammy Davis, Jr., starting in 1950, were best friends and business partners for over 25 years. Sammy Davis Jr. & Jerry Lewis sing Rock-a-Bye Your Baby with a Dixie Melody. ... 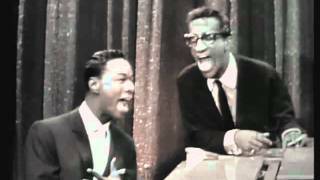 Funny Video of Sammy Davis, Jr. Impersonating Nat King Cole as They Sing a Duet. Happy Birthday Monkey Funny Video, ... Funny Video of Sammy Davis, Jr. Impersonating Nat King Cole as They Sing a Duet. SAMMY DAVIS JUNIOR impersonates his peers.